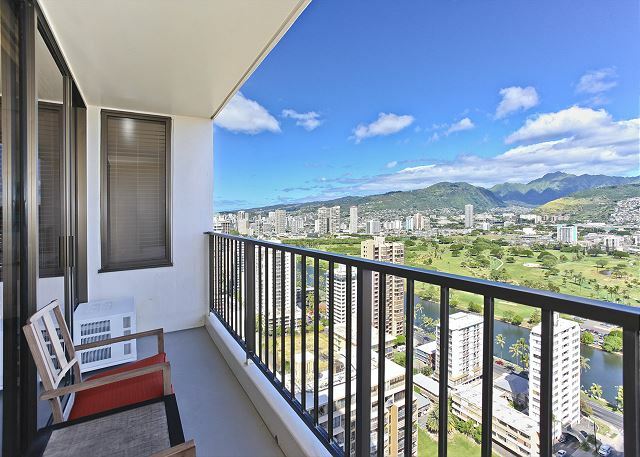 Waikiki Banyan #3205-T2 - Ko'olau Mountains & Ala Wai Canal Views - City Lights Sparkle at Night! 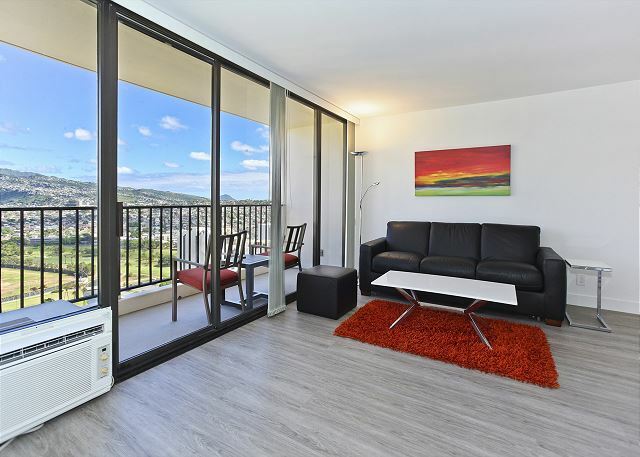 Enjoy beautiful views of the Ko’olau Mountains by day and city lights by night from this contemporary 32nd floor, air-conditioned one-bedroom suite (533 sq.ft. plus lanai with table and chairs). All freshly painted, newly decorated, with laminate wood floors throughout. The living room includes a 42" Smart flat screen TV, DVD player, and queen sleeper sofa. The kitchen (no dishwasher) has Corian counters with breakfast bar and 4 bar stools (no dining table), a countertop toaster/convection oven, microwave, a 4-burner glass cooktop, and it will have a brand new stainless steel refrigerator. Sliding doors separate the living area from the bedroom with platform King bed (NEW mattress; cannot be made as twins). The bathroom has walk-in shower with seat and a hand-held shower wand (NO tub). Coffee shop on premises. Convenient coin operated laundry facilities are located on every floor. Public transportation is readily available, extremely reliable, and located right outside the building on Kuhio Ave! This non-smoking accommodation (which includes lanai), sleeps 4. During our Holiday Season (12/20-1/4) there may be a 10 night minimum. Please check with our Reservation Department for details. Although this year there was a lot of rain our vacation rental was lovely. We enjoyed time relaxing and hanging out in our condo. This is our third time booking this unit and will likely do so again next year. Thank you Captain Cook and Byron for helping make our vacation wonder for another year. Aloha and welcome back! Mahalo for choosing to stay with Captain Cook Resorts and the great review and recommendation! We appreciate your repeat business and we're so glad your visit was enjoyable. We look forward to welcoming you back! I appreciate the best views and best hospitality. Also thank you next time. The Mountain view was great!! And the room was comfortable.We had Good time.Thank you.We really recommend this accommodation. This condo was very clean and comfortable. I enjoyed the minimalist decor and lack of clutter. The bathroom could use updating, but was clean and there were plenty of towels. The view of the mountains was lovely, and a rainbow could be seen almost every day! The rental company was easy to work with and their communication and availability was excellent. first,it was convenient for me that the key of the room was a pin code!so,only got a beach towel and went to the beach every days!Thank you! Aloha and mahalo for taking the time to post a review and recommendation of this fabulous condo. We're delighted you enjoyed your stay and took advantage of the beach, which is so close! We look forward to welcoming you back in the near future. I felt the facilities is old but the kitchen facilities are clean and I stayed comfortable. My children enjoyed pool and playground. Mahalo for your time and input of your recent stay. We are pleased that you and your family enjoyed the Children's Playground and pool. We hope to see you on your next visit! I have stayed in 3605 and then 3205. The bed, the fridge and the TV is better in 3605. The shower room is better in 3205. Mahalo for taking the time to post such a great review! So glad to hear you enjoyed your stay in this great condo! We look forward to your next visit! The apartment was clean, very comfortable and extremely safe. As usual Captain Cook Resort is the best in town to take care of you. I've tried Airbnb and VRBO, Captain Cook NEVER disappoints like others I have experienced since 2004. Location superb. Byron ,the agent , is always effecient and professional. Other people staying at the facility were complaining about their room conditions. We have used Captain Cook rentals on Hawaii for four times now.. 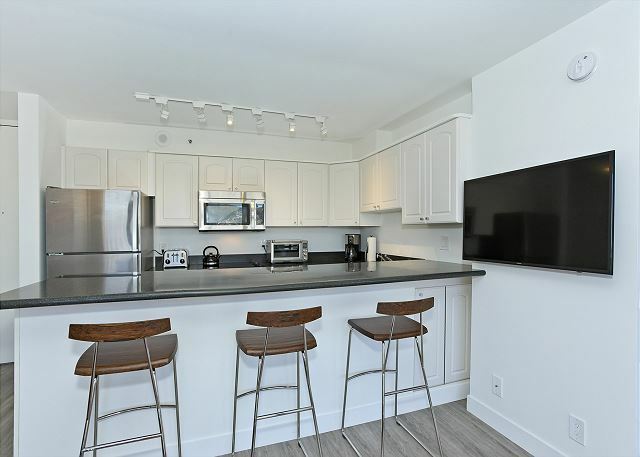 The condos are always very clean and have everything you could need to play at the beaches or cook in house if you want to.If anything needs to addressed the problem is immediately taken care of. As son lives here obviously visit frequently and would NEVER not book through Captain Cook. Aloha and welcome back! 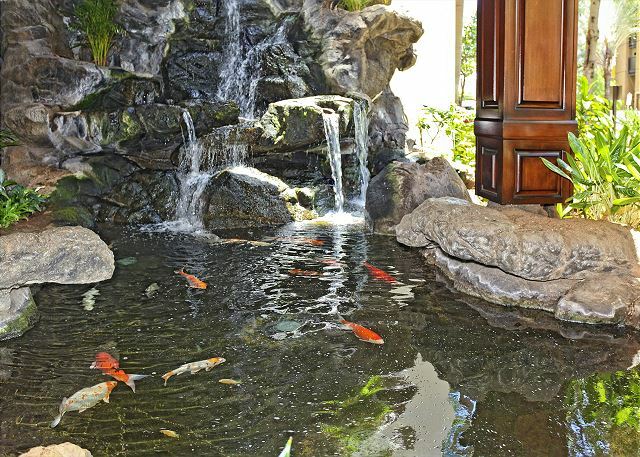 Mahalo for taking the time to post a 5 star review and recommendation of this fabulous condo. We're delighted you and your family enjoyed your stay! It makes our day to know our dedicated staff was able to make your vacation from start to finish a wonderful experience. We look forward to welcoming you back in the near future. Mahalo for the positive comments and recommendation! Thank you for alerting us the the issues with the sliding door. Waikiki is a busy place and can be noisy at times and we are sorry you were disturbed by the sirens. We look forward to seeing you on your next visit! We loved this room. It was bright, clean and the view was prefect. Mahalo, for the great review and recommendation! Hope to see you on your next visit! Mahalo, for the great review and for choosing to stay with Captain Cook Resorts during your recent visit to Hawaii. We're so glad you enjoyed your stay and pleased that you appreciated the location of this incredible condo! We look forward to your next visit! 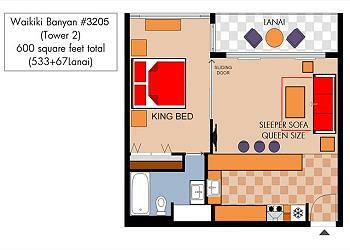 This is our 3rd time staying at the banyan but the first time in this unit. It was clean other than the dirty sheet left in the sofa bed. The king bed was comfy. They provided everything we needed to prep a meal. The toilet was making noises but we didn't report it. There is a nice view of the mountains as you can see from the photos. It is a nice bright unit. Aloha and welcome back! Thank your for the review and recommenadtion for this wonderful condo! We appreciate your repeat business and sincerely apologize that you encountered these issues with the sheets and toilet. During your next visit, should you encounter any problem, we hope you will allow your property manager to resolve any issues during your stay. They are on call for you 24/7. Hope you can enjoy a return trip to our beautiful islands soon! This was our very first time renting a condo, as we typically stay with families when visiting Hawaii. We absolutely LOVED our stay at this condo. The contemporary decor, was a nice added touch to the outstanding and spectacular views. The pool/play area for little ones and BBQ area on the recreational deck was an added bonus, we made sure to take advantage of these great amenities. The location was nice, lots of places to eat within walking distance and just a few steps from the beach. I would most definitely recommend this condo to families and friends. Aloha! Thanks so much for leaving such a great 5 star review. Happy to have provided all of the needs you required for a wonderful family vacation! It's what we're here for! Hope you can enjoy a return trip to our beautiful islands soon! Very good location and the manager Byron is very helpfull...the property is very nice and fully equipped. Thanks Byron for extending my check out time for free. Fantastic, modern, spacious condo a block from Waikiki ocean front. 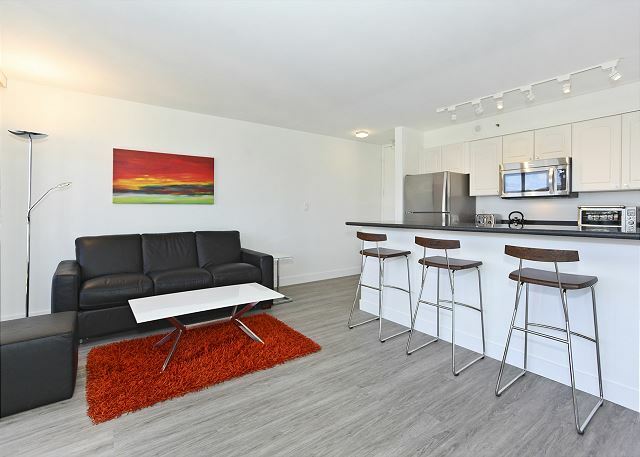 This condo had everything you need, full kitchen, large beg and modern bathroom facilities. Parking and wifi included. Captain Cook Real Estate gave us late check out as the condo was not booked, which was fantastic as our flight was not until 9pm back to the UK. Mahalo, for taking the time to post this fantastic 5 star review and recommendation! Hope you can enjoy a return trip to our beautiful islands soon! Overall a good experience. Condo unit was very clean, well stocked with kitchen and bath necessities . Location good. Air conditioner needs to be looked at. It is so, so loud. Aloha David and thank you for posting a review and recommendation about your recent stay. I will pass your comments about the loud air conditioner on to your property manager. We appreciate your feedback and will look forward to your next visit! We typically stay on Waikiki beachfront, but wanted to experience what staying inside the neighborhood. This property was ideal in that sense. Not the newest property, but overall, clean and reasonably quiet. Included parking was a huge plus. My husband and I love the view of the mountains from Waikiki. This condo is high up enough that the view is uninterrupted -- beautiful all day and night long. 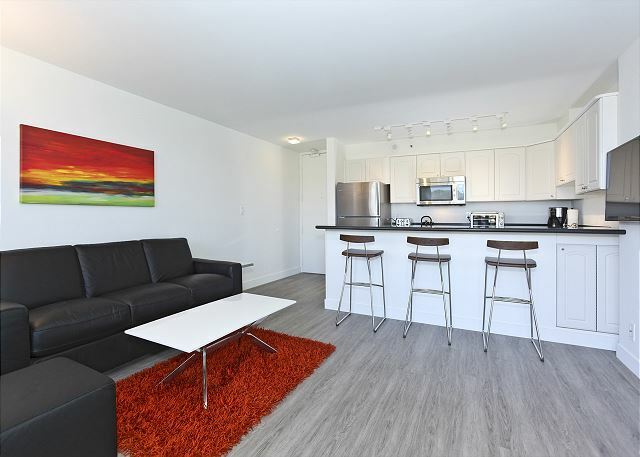 The condo itself is very modern, exactly as pictured on the site, and very clean. It has to have the most comfortable bed we've ever slept in on vacation. Having easy Netflix access through the TV system was a bonus. The Captain Cook staff were great, especially Byron, the property manager. Our flight was delayed five hours, and he still met us and was cheerful and helpful at 1 a.m. Big mahalo to Byron! We can't wait to book our next vacation with Captain Cook! Aloha Lisa! Thanks so much for leaving such a great review. Happy to have provided all of the needs you required for a wonderful vacation! It's what we're here for! We look forward to seeing you on your next visit! P.S. We think Byron is super to work with, too! 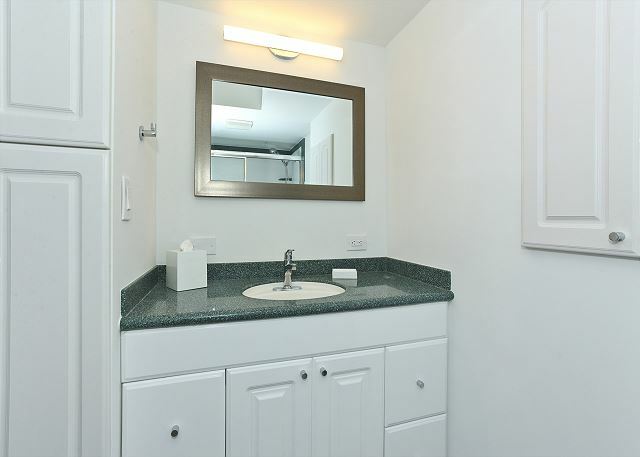 Really good Condo of Waikiki. Really everything you need is there in the room (AC is brand new! :) ) - abc stores are only a short walk. View is outstanding and you really get a good view of mountains and night view. Love to come back again! thank you. Mahalo, Naoyuki! We would love to host you again and hope you can plan a return visit soon! Our stay in this unit was flawless from beginning to end,unit was well equiped had everything we needed to enjoy our holiday, including beach chairs. thank-you everyone at Captain Cook Resorts. Mahalo, Dave, for the great review! Flawless... wow - we thank you for that! Hope to see you again soon! Beautiful, updated condo, fantastic sunrises, 2 blocks to beach! Another excellent stay from VRBO. Communications w/ Captain Cook from booking to arrival to departure was great. Condo was as beautiful as the pics. Location was perfect for us: walking to beach, easy in/out via Kapahulu, stroll to dining & shopping, awesome sunrises. Mahalo for sharing comments about your recent stay, Joey. We're happy to hear you enjoyed your stay at Waikiki Banyan, and those amazing sunrises over the Ko'olau Mountain range! Hope you're able to plan a return visit soon! 4 nights in a very nice condo, recently remolded. Very nice. Night view of the mountain was fantastic. Bed was excellent. 3 minute walk to the beach. Many restaurant choices within 5 minutes walk. Mahalo, Jeff! We're happy to hear you enjoyed this condo and can return for another visit soon! Extremely satisfied with the experience, especially appreciated the aloha from our agent, Byron. Mahalo Andrew! We appreciate that you chose to stay with Captain Cook Resorts and hope you can visit again soon! We enjoyed the property and condo very much. Was ideal for travel with a baby. We were the first people to stay in this particular one since an upgrade, so a few things were missing (dust pan, fan for bedroom, no coffee for the first morning ??) but the starter package that was provided was good, location is perfect, and people were very friendly and helpful. We will be returning! Mahalo for the great review, Renee! We apologize - there should have been a complimentary 8-cup coffee pack in your starter pack. But we're so happy you enjoyed your stay! The dust pan is now in the unit - and your property manager can provide a fan if you need. Just give him a call!